The Nagauta-based shûgikyoku "Tsuru Kame" was written in 1851 by Kineya Rokuzaemon X. It was musically staged for the first time in the 11th day of the 12th lunar month of 1851  in Edo in a daimyô residence. On stage with Kabuki actors, it was produced for the first time in January 1885 at the Chitoseza to celebrate the official reopening of this theater in February 1885 with a new name [more details]. "Tsuru Kame" is a celebratory dance, first performed in 1851, and still occasionally staged in full production in the Kabuki theatre to commemorate an auspicious event. 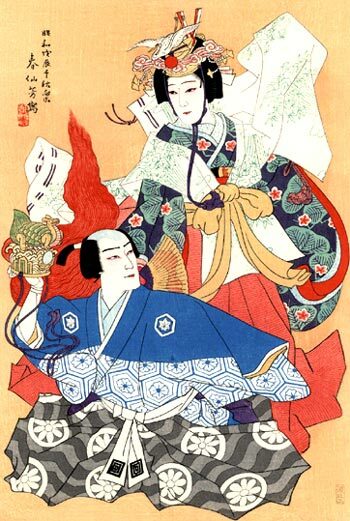 Its words are taken from an earlier Nô play, although the Nagauta music dates only from its first Kabuki performance. The scene is set in the Imperial Court of Ancient Cathay. The Chinese Emperor enters with attendants, two of whom wear the headdress of, respectively, the crane and the tortoise. These are both symbols of good fortune and longevity in the East. The words relate that the court officials line up in front of His Majesty and bow before him, and continue by describing the magnificence of the palace grounds where the crane and the tortoise reside. The courtiers playing the crane (which reputedly lives for 1,000 years) and the tortoise (which lives for 10,000 years) are instructed to dance, which they do in a stately and formal manner. The Emperor himself then dances, followed by further dancing by the crane and tortoise, the words they perform to being filled with lucky imagery. All pray for the Emperor's long life and, it is claimed, for 10,000 years this dance celebrating his reign will continue to be performed. The piece is open to a certain amount of adaptation, and in some versions the Emperor is replaced with an Empress, and in others there is an interpolated dance sequence portraying a girl in love, which lightens the mood. This summary was written by Marion Hudson (2015). The 11th day of the 12th lunar month of the 4th year of the Kaei era was the 2nd of January 1852 in the western calendar.